Tried to stop gambling? If you or you have a friend or family member with an addiction, of course you did. You’ll may blame yourself, or nag, beg, plead, get angry, try reasoning with them, but it won’t work. Learn as much as you can about the negative effects effects on themselves as well as on others. Gather concrete evidence - absenteeism, school performance, debts, etc. Speak to a trustworthy person – a minister, family doctor, parent or counselor. You don’t have to reveal the gambler’s name, but you should talk about them, and get support and more resources for taking action. Have contact information – local counseling, Gamblers Anonymous locations, a help line etc. You can’t stop an individual from gambling, but at a time when they are suffering, they will be more receptive to the information. Don’t hide the problem from others by making excuses, lending money, and covering up for them. You’re not helping, you’re enabling them to continue their behavior. If you tell friends and family the situation, they can add additional pressure and support you in your effort to get the gambler professional help. Don’t condemn, scold, chastise (I know this is very hard to do) but it won’t work. Talk rationally when the person is open to it. In addiction - and talk about their behavior, don’t attack them personally. Talk in terms of “I” Tell them how you are affected. And if the person agrees, give them the phone numbers and information you’ve collected. It often helps to speak to a professional or go to Gam-anon so you can discuss your own feelings and get support. If the gambler chooses not to stop, at least you’ll make life better for yourself. This is a slooooow process. There will be relapses, but keep on trying. 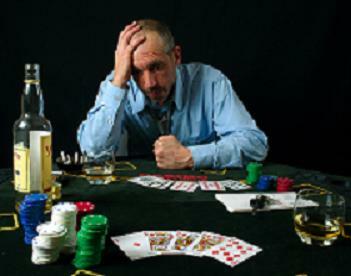 A gambler has to learn what triggers his/her stress, develop new friends and new coping strategies. You will be manipulated, coerced, bullied and feel guilty, but stay strong. This is a one day at a time for everyone! Gamblers Anonymous is an excellent resource for self help meetings and financial support. There’s also Gam-anon, for families and friends. You’ll find more info at this site as well.